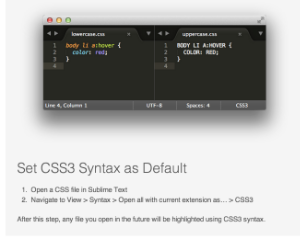 Are you having trouble with Sublime Text's CSS Autoprefixer package? Were you unable to get it working out of the gate? Or even worse, after a year of autoprefixing perfection, has it suddenly stopped working? I can say yes to both. In my case, installing the CSS3 Syntax package, then changing the default extension from 'CSS to CSS3' is what did me in. Too be clear, installing the package didn't create the headaches, changing the default extension (an option the package enables) did. So, before you spend hours searching for a fix, or resort to resetting Sublime Text to it's default state (like I did), give this simple solution a shot. Below: The instructions that got me into trouble.